This morning Mickey took an early lunch and we went to the ND bookstore--which was really dumb to do the day before the first home game--to pick up THE SHIRT. Mickey thought everyone should support the team so we bought 5. I thought it would make a cool family picture but a certain M refuses to wear it. Darn her. 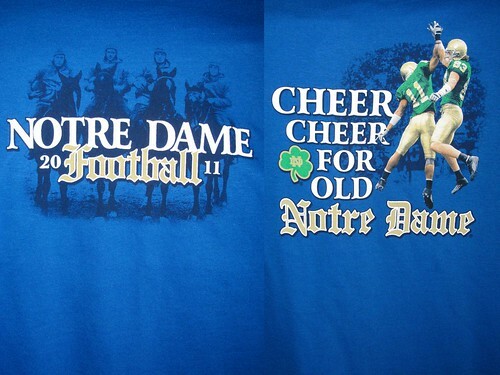 The other two were thrilled to have an ND shirt and can't wait for their turn to go to a game. Tomorrow's my turn but it's supposed to be hot and stormy. I'm thinking I'll let someone else go in my place. In other news, Kade had his first soccer practice today. It was very hot today and Mickey said he was drenched in sweat before they came home. I'm sure his cheeks were redder than his hair. All the kids are looking forward to a three day weekend. They just started school. Why are they ready for a day off?